Knapsack Sprayers are conventional and most popular equipments used world wide.. They are ideal to spray insecticides, pesticides, fungicides, herbicides etc.. In field areas to protect the crop from pest attack.. These Sprayers have multiple applications, and are widely used in agriculture, horticulture, sericulture, plantations ,forestry, gardens etc..
Best Sprayer NF-14 Yellow Knapsack HDPE Tank with 4 Nozzle Set Garden Sprayer, Capacity: 16 L is a premium quality Sprayers from Best Sprayers. Moglix is a well-known ecommerce platform for qualitative range of Sprayers. All Best Sprayer NF-14 Yellow Knapsack HDPE Tank with 4 Nozzle Set Garden Sprayer, Capacity: 16 L are manufactured by using quality assured material and advanced techniques, which make them up to the standard in this highly challenging field. 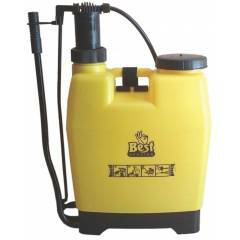 The materials utilized to manufacture Best Sprayer NF-14 Yellow Knapsack HDPE Tank with 4 Nozzle Set Garden Sprayer, Capacity: 16 L, are sourced from the most reliable and official Sprayers vendors, chosen after performing detailed market surveys. Thus, Best Sprayers products are widely acknowledged in the market for their high quality. We are dedicatedly involved in providing an excellent quality array of Best Sprayers Sprayers.